Sew what? 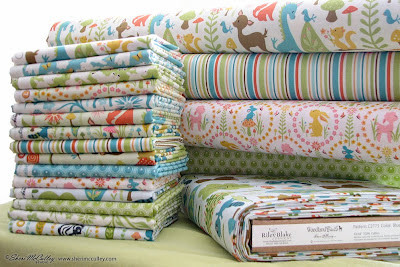 Sew lots and lots! 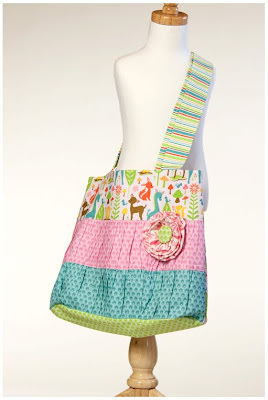 Sew for a boy, sew for a girl, and even sew for yourself. Here are a few photos of the Woodland Tails cotton fabric collection with RBD. It is better than the photos show, it is perfect. 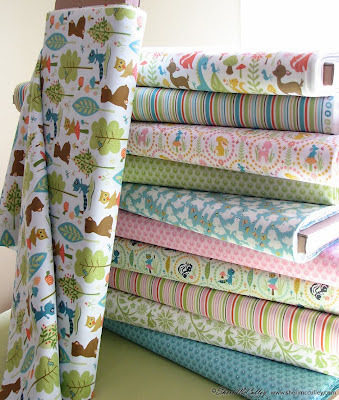 It is just the thing for that hip and all natural baby and kid decor that is all the rage. It’s even cool for us older youngins too. I am hoping to eventually get a bag made from a few of the prints in this collection. Maybe I’ll even make a bag for each month of the year. 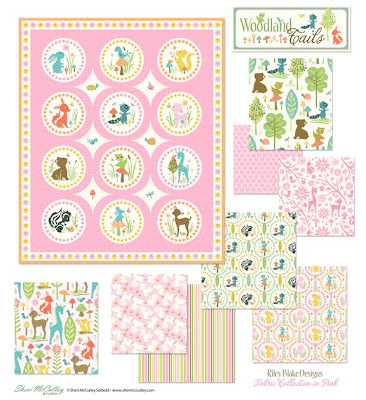 The panel was designed with all 12 characters, and it would surely be cute as 12 different carry-all bags with an animal on the front of each and complimentary prints surrounding it. The sample photos shown below are compliments of Riley Blake Design (not my creations) and I want to share them with you to inspire. 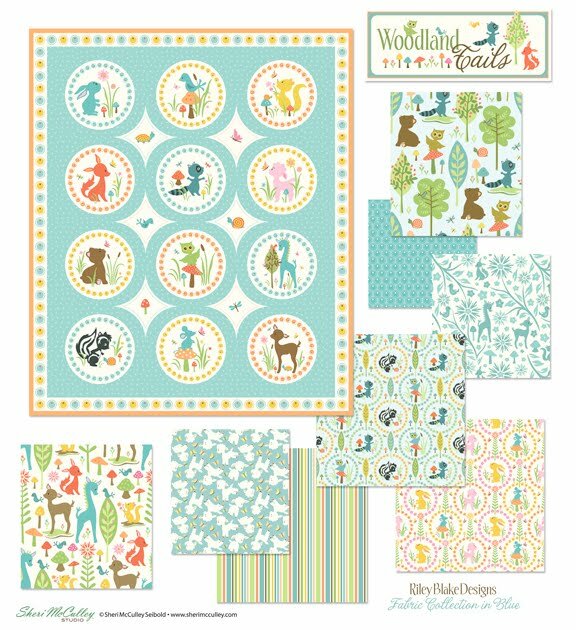 They are of a super neat carry-all bag, a bib for tots and a lovely quilt showcasing the Woodland panel in blues and sweet soft blocks. 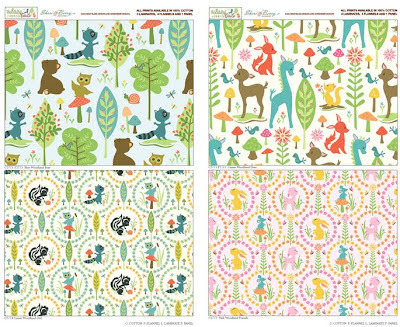 Here are the Woodland Tails fabrics available through RBD. 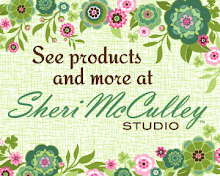 For further information and a location map of quilt shops near you, go here to learn more and see other fabrics from RBD including my ModTod collection, also available in stores now. Sweet, petite and pretty neat! Something for girls, something for boys, something for us all! 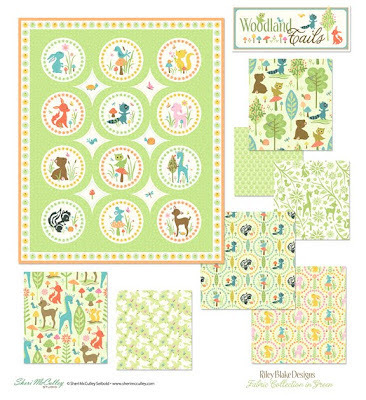 My cotton fabric samples just arrived from the Woodland Tails collection I did with Riley Blake Designs. I think they are perfect and look just like my original art. The colors are fantastic, the fabric is wonderful. I am delighted. 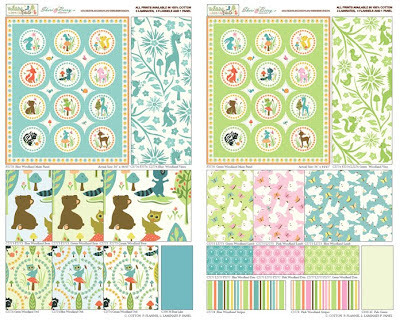 I am showing you the three colorways here, but will show you the actual fabrics as soon as I have a chance to take photos this weekend, and will post that before the weekend is over. 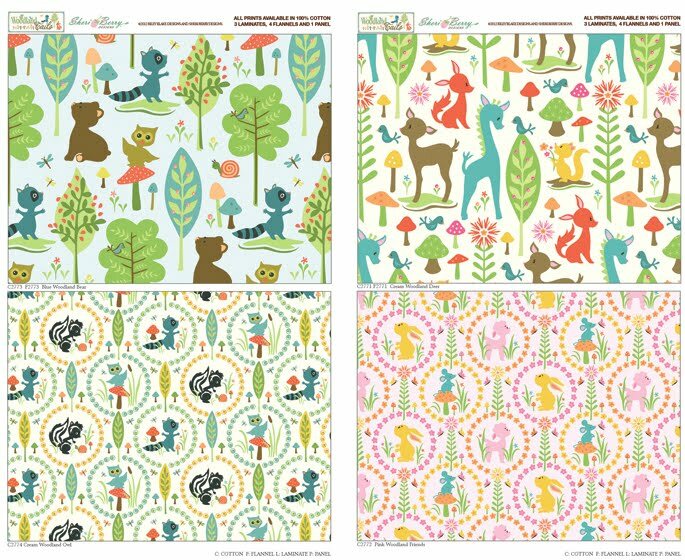 Just to review, or if you are new to the Woodland Tails collection in fabric, here are the three colorways, in blue, green and pink. 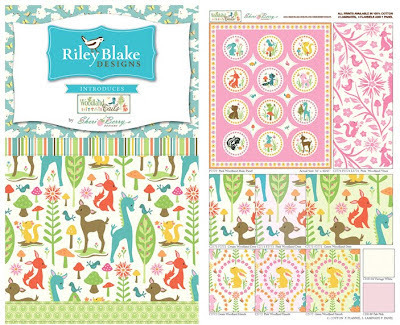 Riley Blake made fabrics in this collection into cotton, some flannel and even a few prints into laminates and ribbon. To learn more about where to find Woodland Tails in fabric and what is available go here to the RBD site. I think we might need to have another fat quarter give away with some of these prints, maybe once I get my member count up to 120. That’s less than 15 peeps to join, super simple, right? 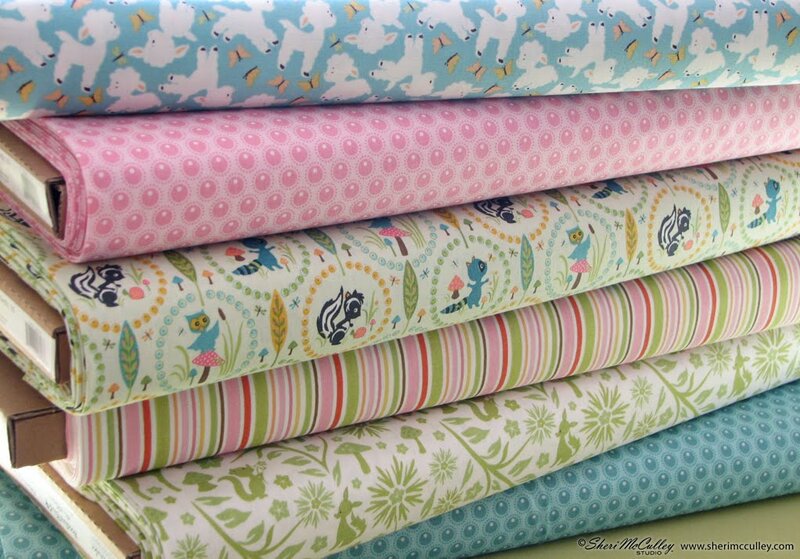 :) I will let you know about that also in the next posting with the photographs of the fabric. You can always comment now, but I’ll let you know where/when to comment to be in the drawing to win the fat quarter set. 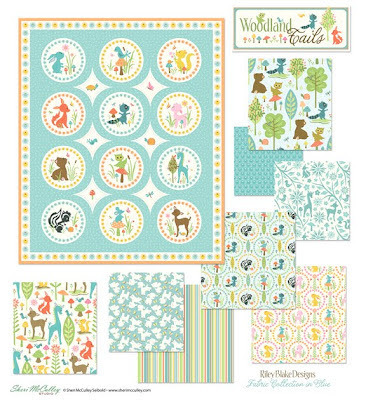 I am also playing with the idea of having embroidery patterns available of the Woodland Tails animals and many other pieces of art from various collections I have developed. I would love to hear thoughts from any of you regarding this idea. They would not likely be kits to buy with pieces to assemble; rather a pdf file to purchase and download to create for your own purpose. A while back I designed a little fireman collection, as I had learned that many people like the theme for their little guys. 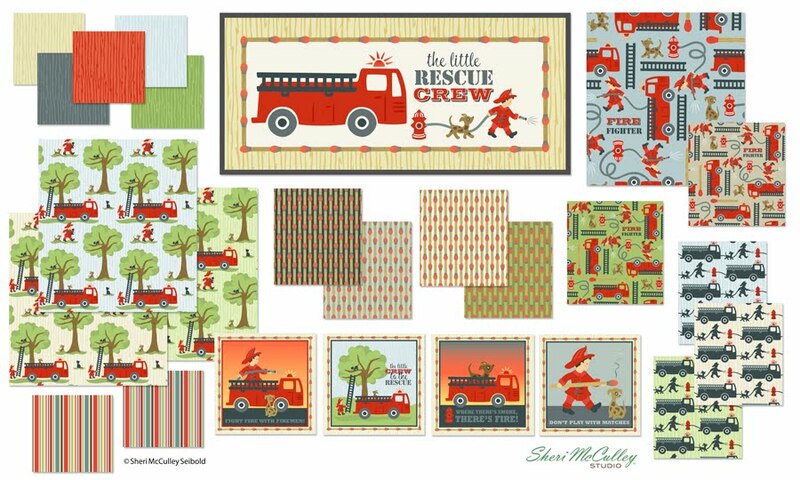 I decided that “Little Fireman” wouldn’t do the name justice so I have called the collection Little Rescue Crew since these little helpers do more than fight fires. 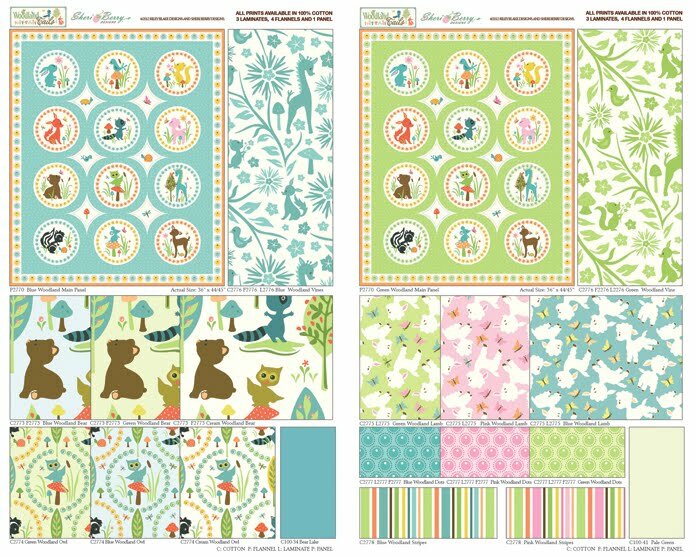 Here are some ideas I have for the collection (below) and the set of patterns (above) that I have developed for the theme. 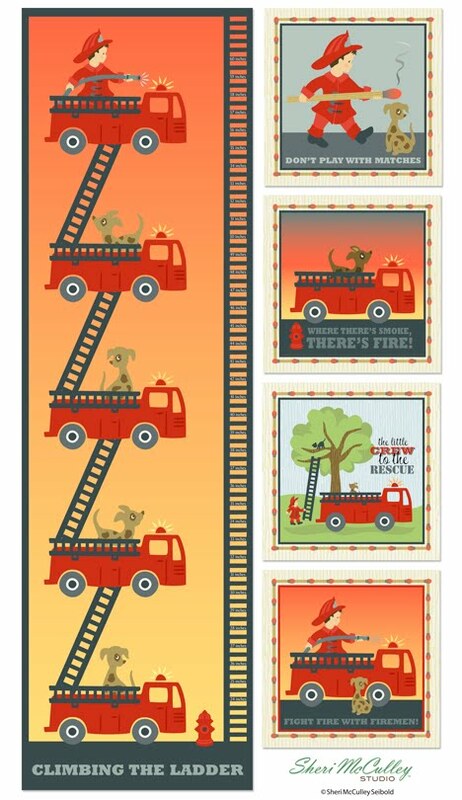 The growth chart above, with the stacking fire trucks, would be fun for a little boy’s room and the signs would make good wall art. Maybe one day I’ll be working with a company that will produce them. Until then, let’s just look for a crew to come and rescue this little guy and his pals. Meet Tawni, the island girl, ninth wee character in the Wee are the World series. She comes to us from the West Indies, or better known, Caribbean. 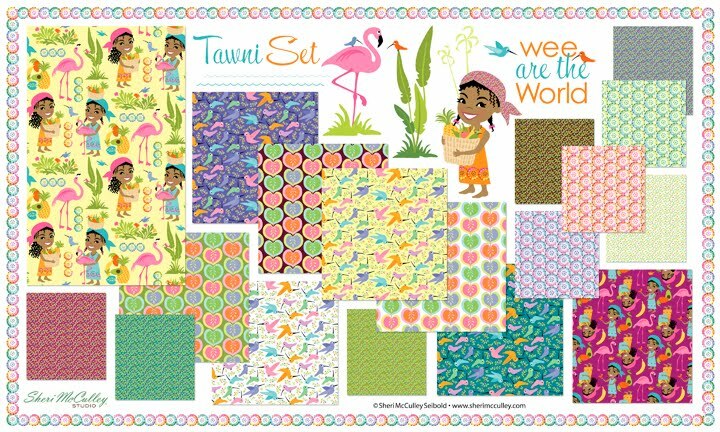 Her islands are full of charm; canvased with a beautiful array of colors, and dotted with tropical birds, large and small. Tawni was influenced by my very best childhood friend, Stephie, an island girl herself. She and her family had moved from their tropical paradise in Trinidad and I had just moved from the midwest were we met and became immediate besties in the Pacific Northwest, a land unfamiliar to either of us. 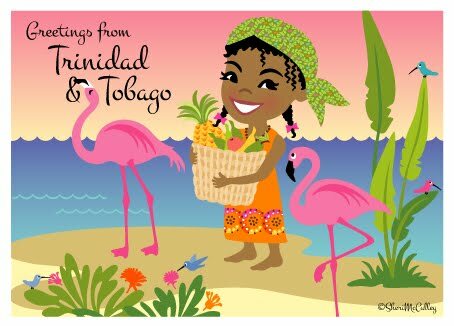 I have wonderful memories of being with her family eating fried plantains (okay, not my favorite food:) and drinking tropical smoothies, which back then we called health shakes. I learned new words and phrases said in the most lovely accent, to my ears, which was both British and Island-ish, as my young mind would hear them. I would try to imitate it, but with an “Okie from Muskogee” drawl, it just didn’t have that charm, nor did I.
Steph and I came from completely different backgrounds and really didn’t seem to have that much in common, until we did. And boy did we. We turned culture-clash on its head when we became besties. We were, and still are today, two peas in a pod. No one makes me laugh like Steph does. No one makes me think like she can. No one makes me appreciate life like little Stephanie did all those years ago and still does today. My world is more beautiful with her in it. Steph has two older sisters who actually are twins, but she will always be my twin, separated at birth, but with a better accent. It seems like every bit of valentine decor from my childhood had something to do with cupids, lots and lots of hearts and doilies, and red, white and red. 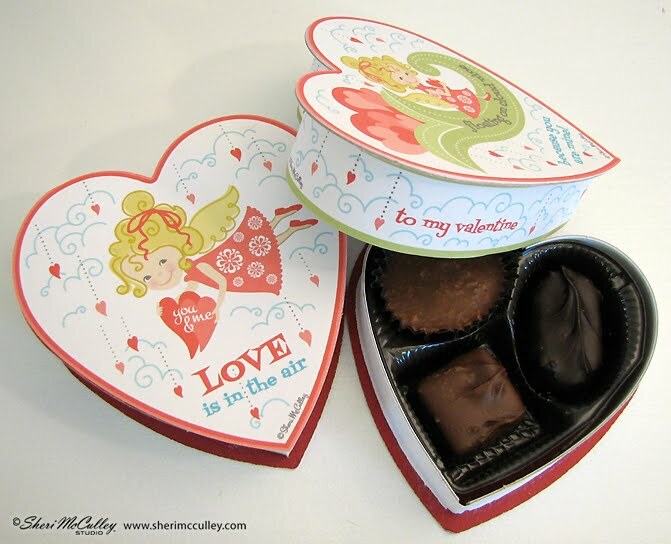 Our teacher hung red hearts from the ceiling, stapled cherubs to the bulletin boards and positioned a decorated valentine box on the corner of her desk for all to fill. We knew the drill come February 14, and we loved it. 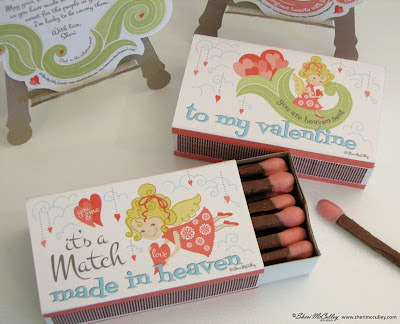 Miniature valentines in hand, we would file up to her desk and stuff that beautiful box full of heartfelt affection and kitschy phrases. It was a tradition we loved and we prepared for it starting on January 2. 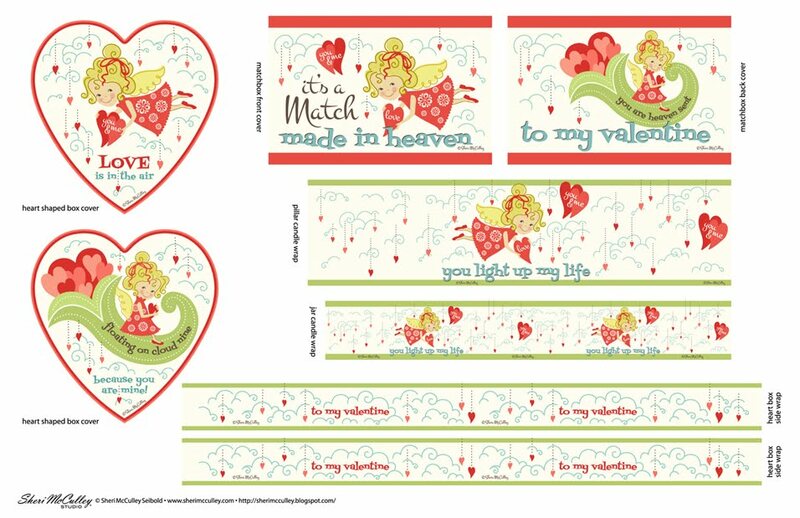 Well, we started making handmade valentines in January, but those cool, boxed valentines from the dime store couldn’t be picked out until early February. Once childhood was over, Valentine’s day lost its excitement for many years. It was sweet, it was thoughtful, but it didn’t have the thrill that it once had. Maybe that’s how it should be, but twenty-two years ago I decided to do something about it. Something that would make February 14 special every year, and would usually begin in mid January. I decided to create handmade valentines for all of the women in my life; my family, my close friends and my coworkers. I knew they thought the cards were for them. I knew they thought the message was to them. They couldn’t have been more right. In a way, however, the cards have also been for my passion to create from my hand. The message has been to help remind me of the value of these people in my life. The labor has always been a labor of love. 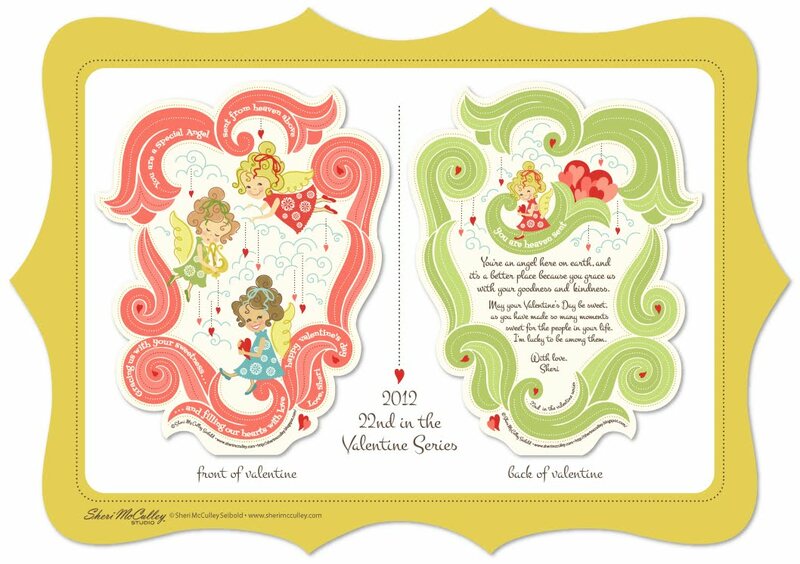 This year my valentine is all about those typical icons that floated above my desk in grade school and were pasted to the classroom walls and bulletin boards during February. Indeed, the hearts, the red, the gold and little celestial beings are all here. They may not be cupids, but they are as angelic as can be. 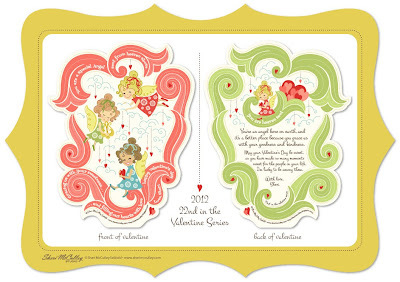 This year the valentine comes as a little work of art to be placed on a golden easel. The message shares my sentiment, that the recipient is an angel here on earth . . . sent from heaven . . . filling our hearts with love. How true it is, and how lucky for me to be among the people graced by them. 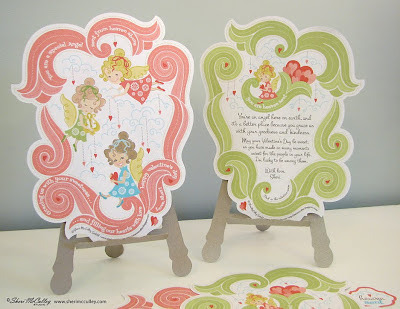 Since few of you will have the handmade valentine waiting in your mailbox today, please think of this post as your valentine from me to you, one of the many angels gracing our earth with love and goodness. Happy Valentine’s day. Now make it that for those you love. A valentine that is heaven sent . . . and freely given! It’s almost Valentine’s day and there is just enough time left to make a gift from the heart for the one you love. Fill a matchbox with chocolate covered pretzels, or get a small Russell Stover heart shaped box of chocolates and recover the box with a sentiment from you (and me:). Your loved one will not only think you’re heaven sent, but will start floating on cloud nine. 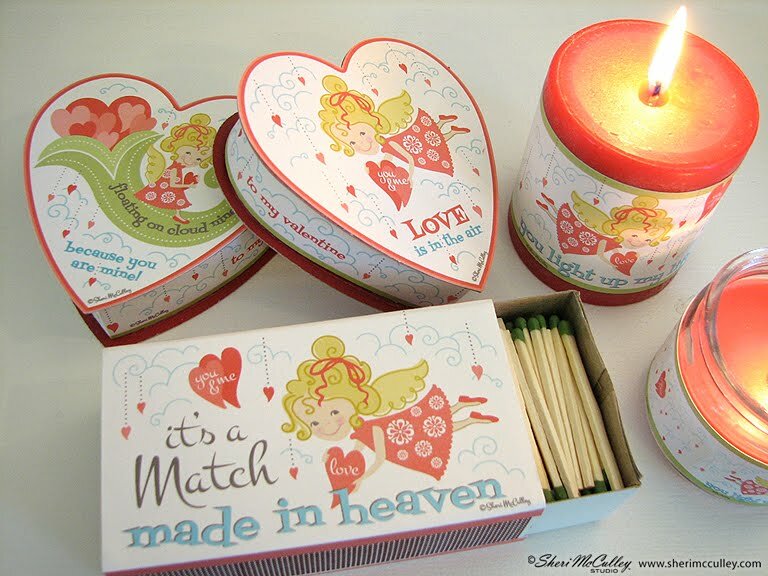 You can either fill the matchbox with homemade chocolate covered pretzels to show off your sweet side, or leave the matches in the box and couple it with a candle to show your warmth and affection. If you like giving chocolate to your sweetheart, choose the small heart shaped box to prove your love by simply covering the top and sides, and sharing the sweetness. 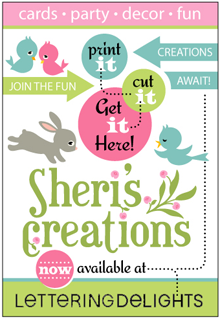 I made these labels available for you as a free download and you can get them by clicking on my U-Pick button at the right side of the blog. They will take just a few minutes to print, cut and glue. The only things you’ll need are a large matchbox, a small heart box and a candle or two if you want to light up someone’s life. Below is an image of the printout. 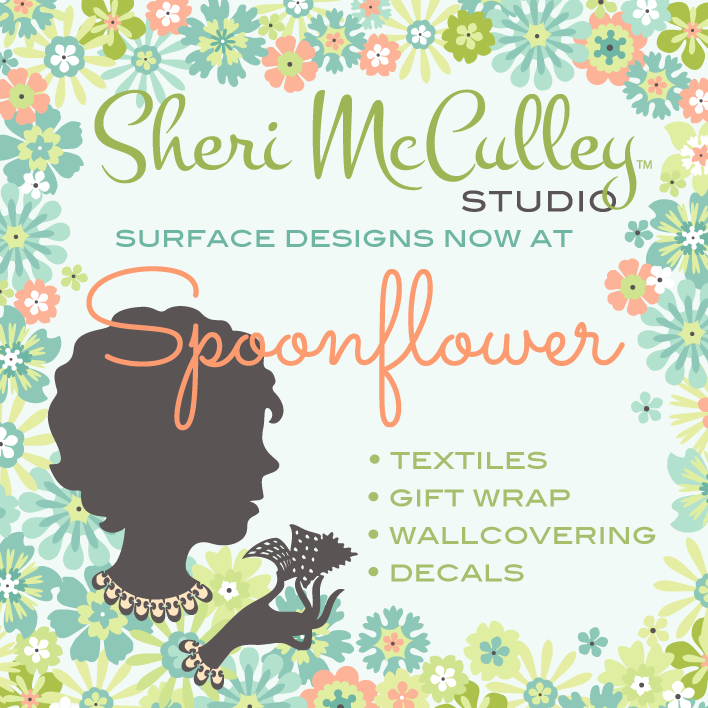 However, you will need to get the artwork from my U-Pick button or click here. 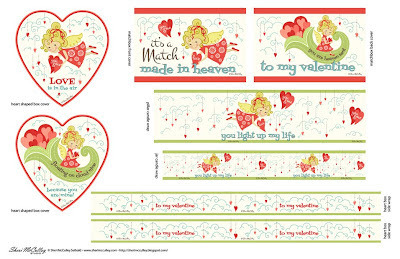 The file name is called Valentine2012Freebie. 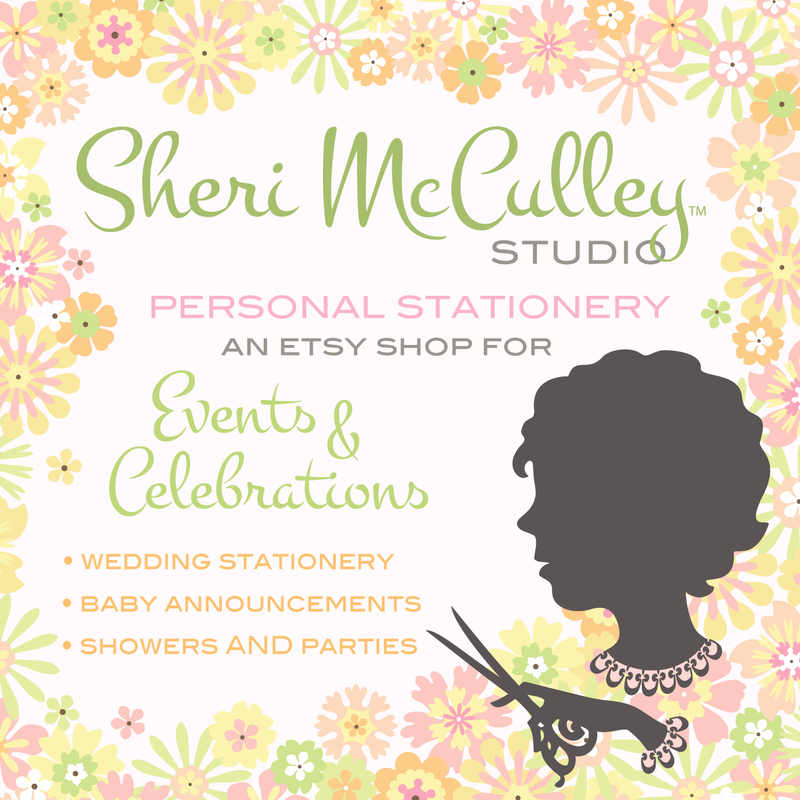 The artwork is formatted on an 11x17 document, and after printing just cut each piece out and adhere to your boxes and candles. I used tape for the candle wraps and tacky glue for the matchbox and heart shaped box. Here is the information on the specific items you will need (shown in the photo below). 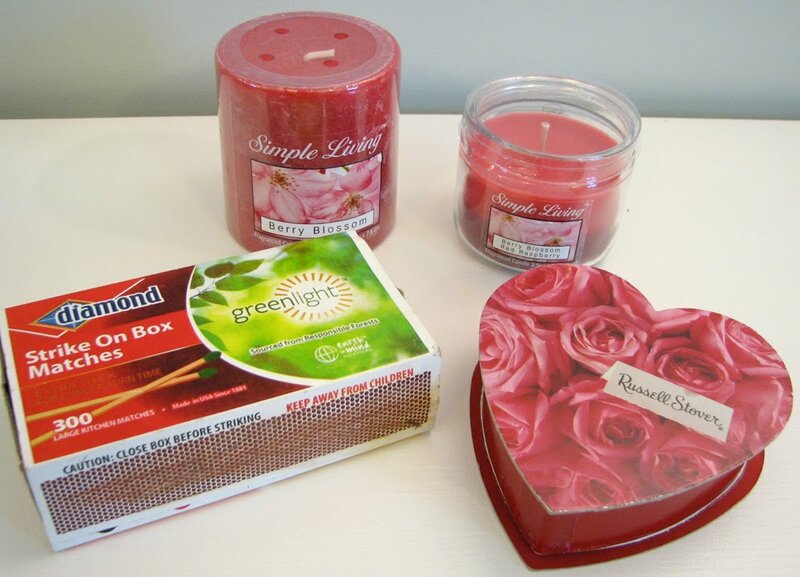 A large matchbox (4.75"x2.75"x1.5"); a small Russell Stover chocolates heart shaped box (4"x4"x1"); a pillar candle (2.8"W x 3"H); a candle in a jar (3.5oz). The candles and chocolate were purchased from Walmart, the matchbox from Target. This is only one way to convince your sweetheart that you’re an angel. I’m sure that is already obvious. Hopefully you and your valentine will be in seventh heaven on February 14. Have a happy and heartfelt one!